The picture shown above is of the Point Wilson lighthouse, in Port Townsend, Washington by the entrance to Admiralty Inlet at the northeast corner of the Olympic Peninsula. 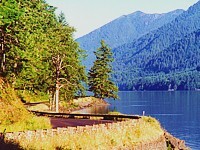 The picture shown on the left is of Lake Crescent and the road to Forks, Washington, in the beautiful “wild west end” of the Olympic Peninsula. Click here for a photo album of some of my photography. I still have many old photos to add and I photograph new scenes every year. 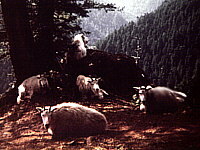 I photographed this scene in Olympic National Park, below the view point at the end of the trail leading from the parking lot just before the first tunnel on the Hurricane Ridge Road. Click here to read some history articles that I've written. 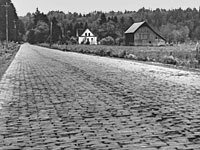 I like researching and piecing together obscure or generally overlooked or forgotten local history, to help retain some local cultural heritage from slowly fading away. These are little histories that bring into focus a few more details about subjects seldom written about. 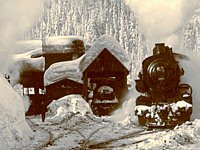 Click here to read about the old logging steam locomotive located by the entrance to Tillicum Park at Forks, Washington. The locomotive is a Pacific Coast class, 3-truck Shay, built in 1930 by Lima Locomotive Works, Incorporated, in Lima, Ohio. 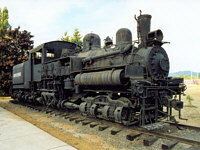 The locomotive operated around Forks, Sappho, Lake Ozette and Sekiu. Click here to read the genealogy page that I have started. 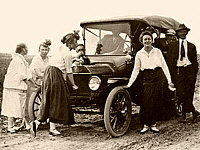 The woman in the photograph cranking the Model-T Ford is my grandmother. I first became interested in genealogy in 1997 after visiting an old abandoned farm house, in northern Minnesota, which belonged to two of my great-grandparents. Click here to read trail notes that I write. I like both day hiking and extended backpacking trips. 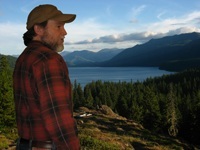 I hike mostly in the Olympic Mountains and the north central Cascade Mountains, but I've also hiked the Pacific Crest Trail south from Chinook Pass through White Pass out into the Goat Rocks Wilderness. Soon there will be a link here to some of my black and white photography. In the 1970s I began developing black and white film and prints. I once asked Josef Scaylea what kind of black and white paper he used and he told me Agfa Brovira and he pointed out its brilliance and luster, so thereafter that's what I used.